Loved, loved, LOVED this book. I adore Forster’s work anyway, but when you combine that with a story of Anglo-Indian relationships during the time of the Raj? Swoon. Having already read A Room with a View and Howards End, I was prepared for great writing, so then to read a book that is favorable to the Indian perspective at a time when that was not common was even better. A Passage to India relates the story of two English women who visit India during the waning days of the Raj and the early emergence of Indian independence. 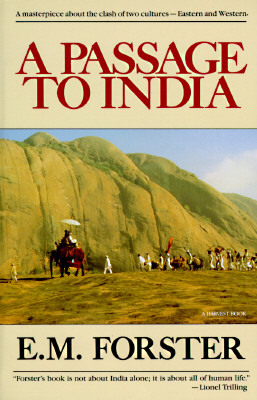 Forster had actually spent some time in India and was sympathetic to the Indian cause, and this is clearly seen in this novel. Miss Adele Quested and her companion (and potential mother-in-law) Mrs. Moore have arrived to spend some time with her son (and perhaps future husband) who is an English colonial representative in Chandrapore, a medium-sized Indian town. Miss Quested is far more interested in wanting to see the “real” India than the Anglo-Indian perspective and this is the trigger that sets everything in motion. Miss Quested (and others) are taken on a day-trip to some nearby caves where an alleged assault happens to her, possibly by a young and very impressionable Indian doctor who has led the trip. This incident leads to a court trial and creates even more of a rift between the local Indian population and the English crowd who live there (and have the power). Can such differing groups ever be friends? That’s the question throughout the book, and even at the end, it’s not really ever answered so the reader has to make his/her own decisions. Forster, as mentioned, is sympathetic to the Indian independence movement, and clearly demonstrates the incompetence of the English administration in this novel. Kudos to Forster for not subscribing to obvious stereotypes for the most part, and if you are a fan of luscious descriptions, believable plot lines and realistic characters, you can’t go wrong with this one. I wonder if the movie is as good as the book? This entry was posted in Uncategorized and tagged British, classic, Fiction, India, Raj by lizipaulk. Bookmark the permalink. IMHO, *no* film is ever as good as the book!